This is one of several conventional bids in bridge. It’s a bid that has a specific meaning and one of the best know examples is the Jacoby Transfer. 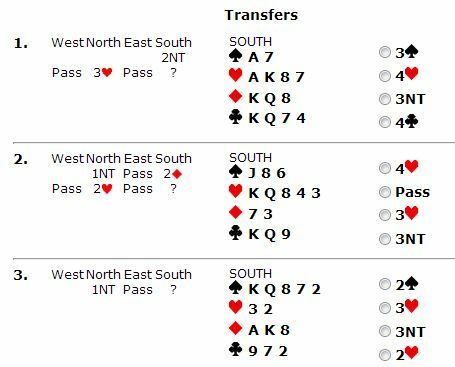 After an opening bid of 1NT, responder will bid 2 Diamonds if they hold 5 or more hearts or 2 hearts of they hold 5 or more spades. In other words, responder bids the suit below the actual suit held. This is a forcing bid and opener has to bid the next suit up – ie the suit that responder actually holds. Why make a transfer bid? Making this conventional bid and forcing opener to bid again, gives the responder the chance to make a further bid as opener cannot pass. This gives the responder an opportunity to further describe their hand. Sometimes it is beneficial for the opener to play the game, rather than responder. Especially if the responder’s hand is relatively weak. Responder makes a transfer bid when they hold 5 cards in a major suit or 6 cards in a minor suit. How do you know if partner’s bid uses the bridge transfer? Before you start playing you and partner will agree whether or not to use the bridge transfer bidding convention. If you decide that you are using transfers then any bid of 2D, 2H or 2S is a transfer bid. At No Fear Bridge you will find an hand out with an extensive explanation of transfer and when to use them, along with a quiz so you practice transfer bidding. Click Here to get your trial membership today if you are an Acol bridge player. 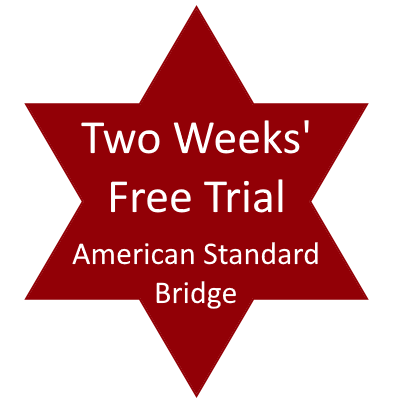 Click Here if you are an American Standard player. « 5 Card Major Bidding	» Should I Lead A Trump? does 2nd bidder ( 1 spade) bid 1 dia to give partner a second chance to bid?? Hello Maree. I put your question to Leigh Harding, who runs No Fear Bridge. She thinks we would need to know the details of your partner’s actual cards in order to answer the question properly.